Olga Vladimirovna Rozanova is an avant-garde artist who harbored a passion for color. Her work entitled “The Green Strip” brought the artist a staggering success and novelty in painting. The picture was painted in oil in 1917 in two author’s versions, shortly before the sudden death of the artist. The picture refers to the flow of supermatism, where color is the main means of expression and the purpose of the work. 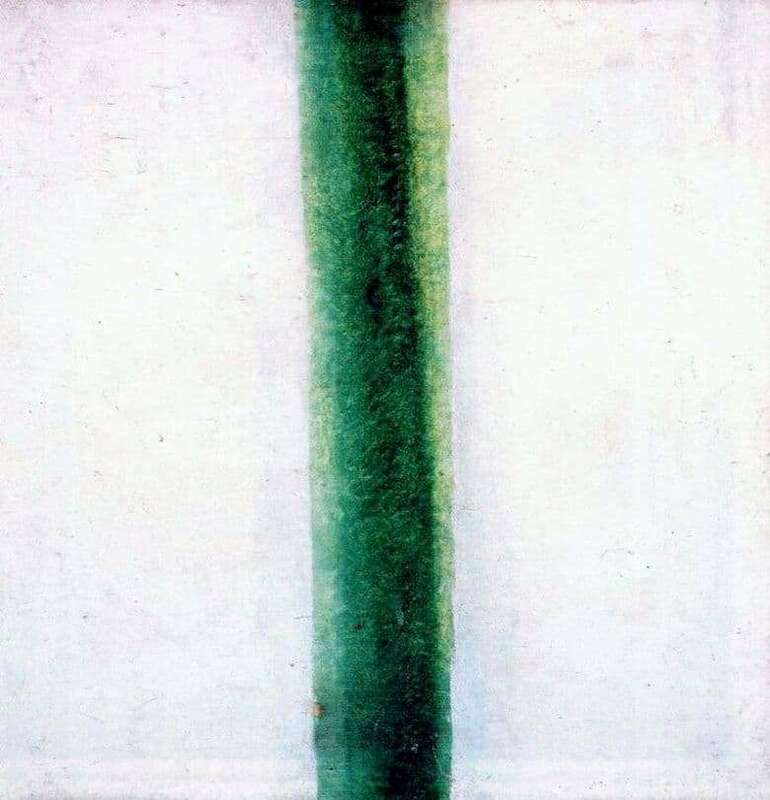 On a white background from the bottom of the canvas in the center grows a strip of green shades. The artist eliminates the dilemma of “part – whole”, “form-background”. There are no boundaries of form, which can be attributed to irrelevance, as a symbol of radical freedom. In the painting, Olga Rozanova conveys the color that it is, independent of nothing and no one. In the product there are no superior facts other than color. “Green stripe”, like infinity, pours onto the canvas and exudes an elusive color glow. Due to the fact that transparent light glazing was superimposed on a canvas primed with white, a color light beam appears to be transmitted to the canvas. This is the effect avangardist sought. There are many interpretations of this canvas. Many personify the band with upright Russia, which stands out from the faceless plane. In its meaning, the Green Bar is comparable to Malevich’s Black Square, but there is a significant difference between the works. The difference lies in the fact that the basis of the work of Malevich is the form, and the basis of the work of Olga Vladimirovna is the color. The image of color, as if separated from the subject and from the plane. Rozanova reflected the green color, like musical harmonies and dissonances. Continuous change of green shade form a variety of unknown sensations.